Did you know that North Dakota and South Dakota became states on the same day? Me either. It was the only time in U.S. history that two news states joined the Union on the same day: November 2, 1889. Both of these states came from the Dakota Territory which formed in 1861. While the brewing industry was sparse in North Dakota, its souther sister state had a much different story. The first records of breweries operating in South Dakota appear 12 years prior to statehood, in the town of Deadwood. Quickly growing to a population of 5000 people, after the discovery of gold, Deadwood also attracted entrepreneurs looking to capitalize on the needs of the prospectors. With 23 saloons operating during the 1870s, there were multiple breweries satisfying their needs, such as Lead City, Black Hills and Central City to name just a few. To commemorate the 40th state of the Union, we were able to try two different brews from Crow Peak Brewing in the city of Spearfish. The first beer of the evening was a Canyon Cream Ale. This beer, which was very light in color, is listed on the brewers site as a light bodied ale, malty dominated with a slight sweet flavor. While I didn’t get the sweetness, which comes from local honey, I did enjoy the light and creamy taste of this beer. There wasn’t any one flavor that over powered this beer, making it something enjoyable and fun to drink. In fact, I just grabbed another one to keep me company as I write this post. 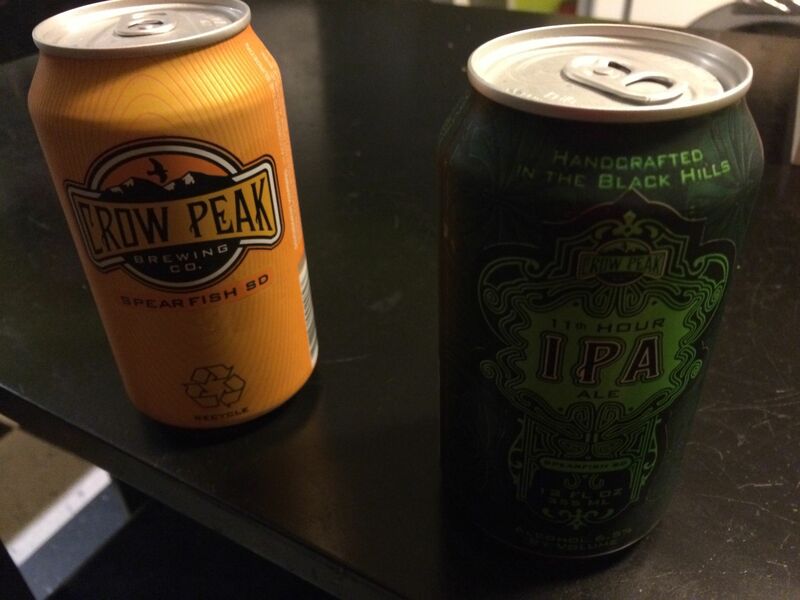 The second and final beer of the evening was also from Crow Peak. This beer was an IPA called the 11th Hour. This beer was quite hoppy, with a slight bitterness that remained for a bit after each sip. This beer too was well received for the evening. In the end, we had a great time with these selections from South Dakota. And it was great learning a few things about the state along the way. Short post this week, thanks for reading.